Have you prepped a protein for the week yet? It’s recipe 3 of 5 that I created from Batch Cooked Ground Beef (really easy, you hardly need a recipe, but here is one anyway!). It’s a series I created with the theme, “prep a protein, pair it with plants throughout the week!” Then fill in the gaps with healthy fat, a little fruit, but always pair it with (even a small amount) of protein, when weight loss is the goal. 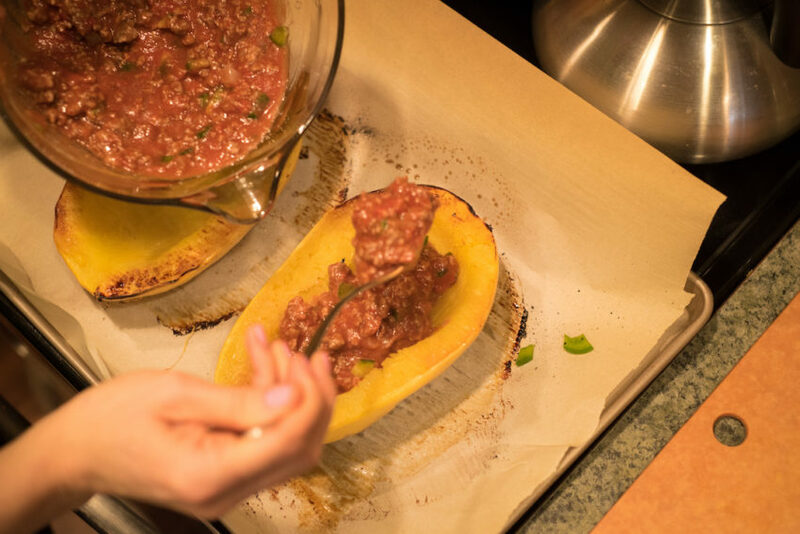 Spaghetti squash – is the perfect plant to pair grass-fed ground beef with. One cup is only 31 calories, 7 grams carbohydrate, and 2 grams fiber. And…it’s extremely filling! I don’t think of it as a swap for spaghetti, because it doesn’t taste like it (to me at least)…I actually think it’s better. Only 3 more ingredients in the filling! Tomato sauce, tomato paste, chopped green bell pepper. 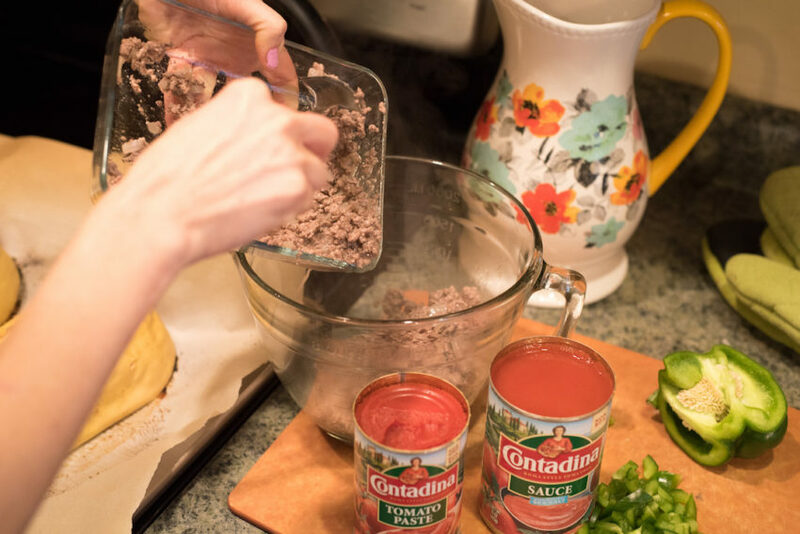 Most ready-made pasta sauces have too much sugar….if they even need sugar at all, since tomatoes reduce-down are naturally sweet; I would rather make a quick homemade sauce with canned tomatoes, which are actually packed with nutrients. 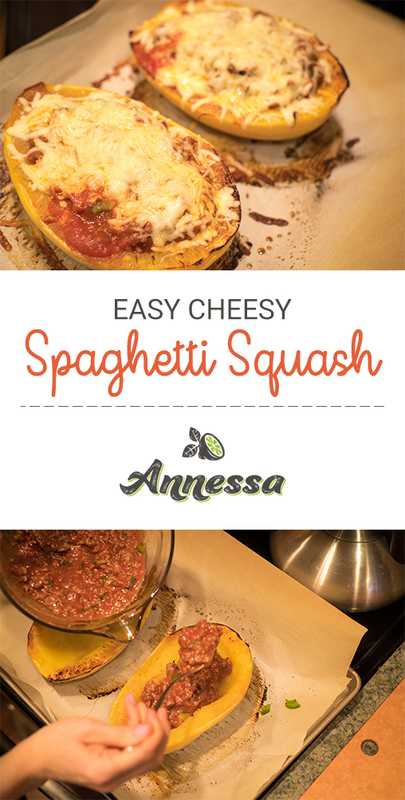 Divide that mixture between each squash…. And back into the oven just until cheese is melted and gooey, and meat is hot! This makes a lot….and it’s a very filling 335 calories, 5 grams fiber, and 23 grams protein each! Make it a great week, friend! 1. Preheat oven to 400º. Spray the cut side of squash with nonstick cooking spray and sprinkle with kosher salt (kosher or sea salt is must! Don’t skip that part…a little salt adds a lot of flavor). Bake, cut side down on a baking sheet for 40 minutes. 2. 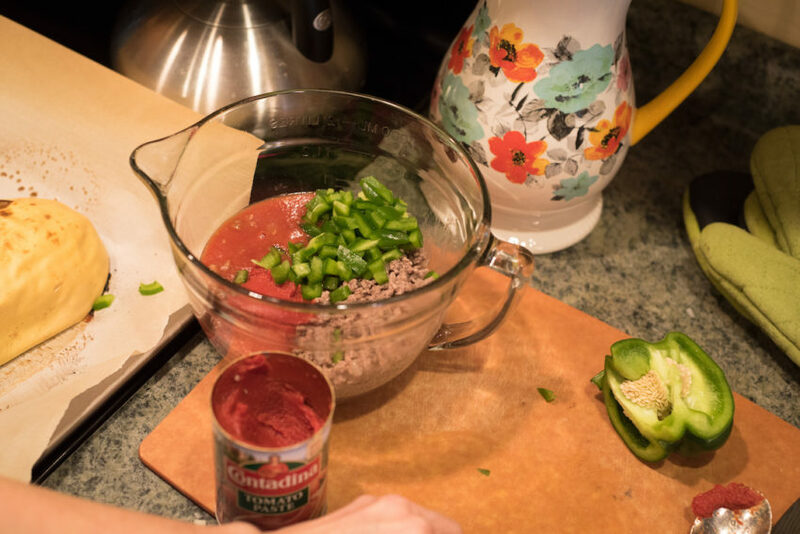 In a bowl, fold together ground beef, tomato sauce, tomato paste, and bell pepper. 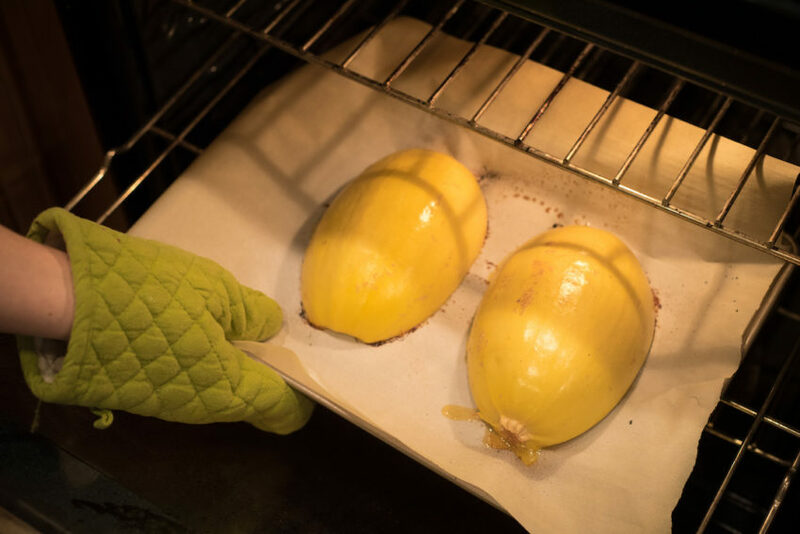 Remove squash from oven, turn them over, and fill each half with tomato-beef mixture. 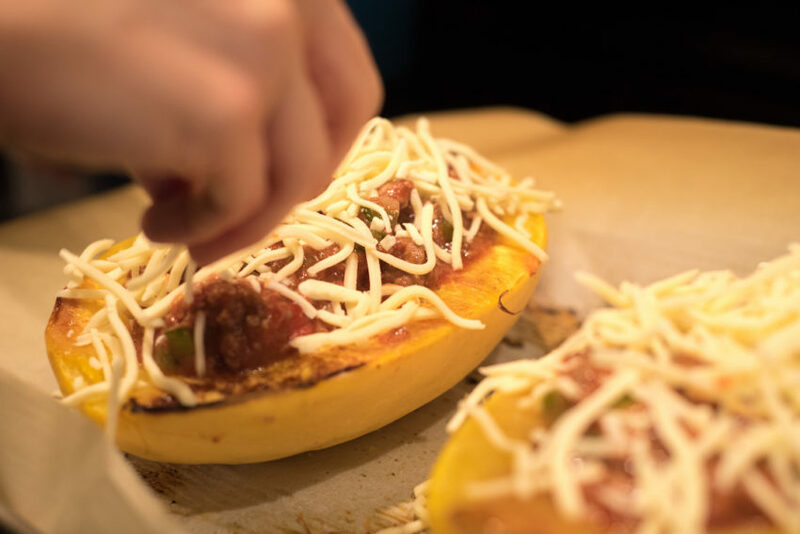 Sprinkle cheese over each squash. 3. Return to the oven until cheese is melted and mixture is hot, about another 20 minutes. If cheese starts to get too browned, cover it lightly with foil. Serve! – if only serving one or two, cook both squashes and keep one of the halves for later in the week. Half of the sauce can be frozen for later use as well! I made this for lunch today and it was so good! Thank you for sharing your healthy recipes. ?